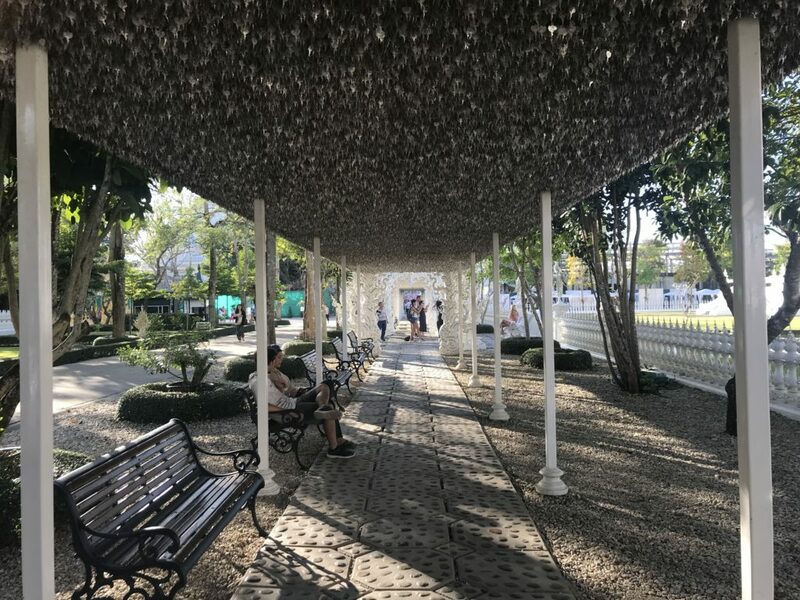 Wat Rong Khun, the White Temple, is probably the most famous temple in Chiang Rai. The complex where it’s located is also the largest of the 4 that we saw and contains many buildings to see. 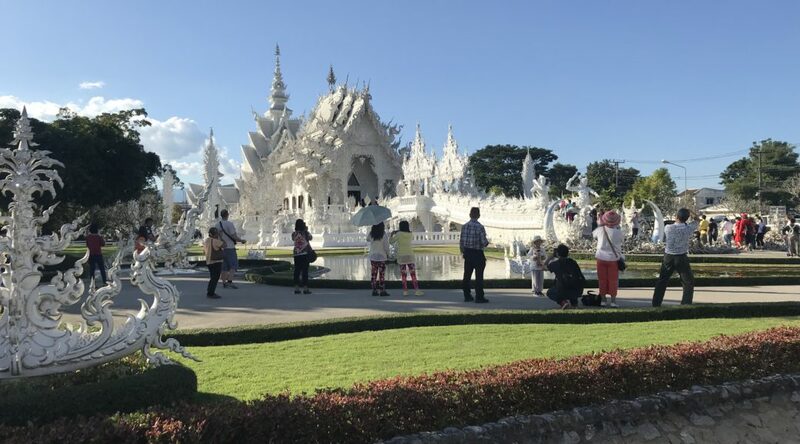 The White Temple is (as you’d expect from the name) painted entirely in white, to represent purity. It’s also covered with small mirrors, so glitters spectacularly in the sun. It’s really an amazing sight. There were times when I couldn’t even look at it because it was so bright! You can easily see (and take photos of) the outside of this temple from the road. 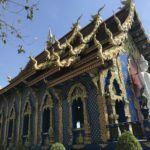 If you want to go inside the temple or see any of the other buildings surrounding it, though, then there’s an entrance fee of 50 baht (£1.10/$1.50USD). I’d highly recommend doing this, as the interior is very impressive. Once you enter the complex there’s a small pond with fountains. 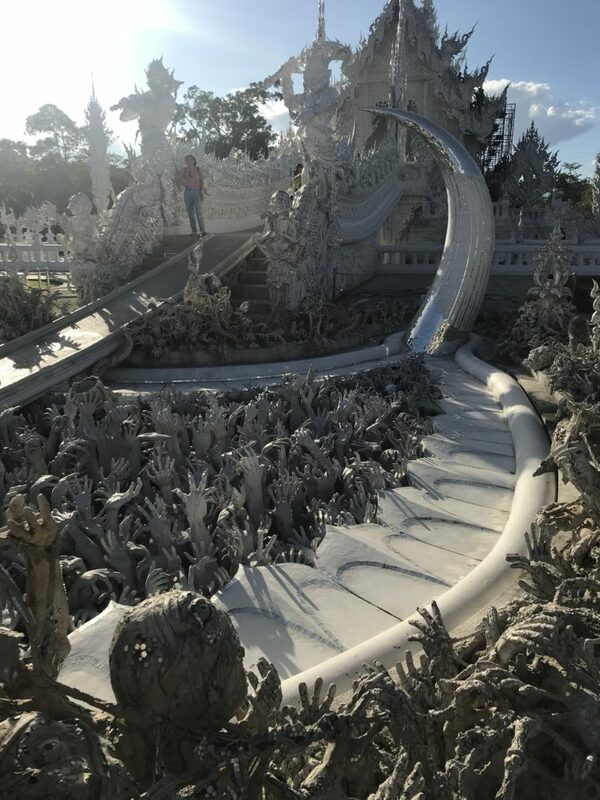 The entrance to the white temple is via a walkway. The ‘theme’ of the walkway was hell, which I really wasn’t expecting. I’d never seen anything like that before. You walk over a bridge, with hands reaching out towards you on either side. Then you go between two horns, like a demonic archway to get into the temple. This whole area is slightly less ‘white’ than the rest of the temple. There are no mirrors and it had been painted grey. It gave an impressive effect of walking from dirty, scary, hell into the beautiful, pure Buddhist temple. When you walk in the first thing you notice are the statues. There was a statue of a monk on the ground with Buddha statues of increasing size behind him. It was quite an impressive and powerful piece of art. The walls were the really interesting bit, though. They had figures from popular culture alongside fire and demonic imagery. The interior was designed by Thai Buddhist artist Chalermchai Kositpipat. His concept was to contrast the good and the bad using images from popular culture. The idea seems to be to show that people should turn away from popular culture in favour of Buddhist values. Around the temple itself there are other buildings and religious areas to see. 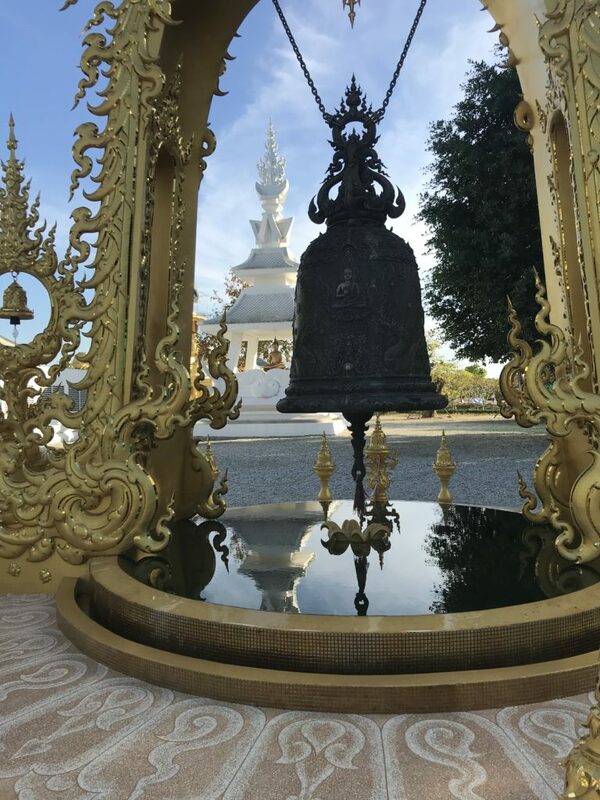 We particularly liked this bell, but there were buildings, statues, fountains and more. The theme of good vs bad continues outside the temple too. 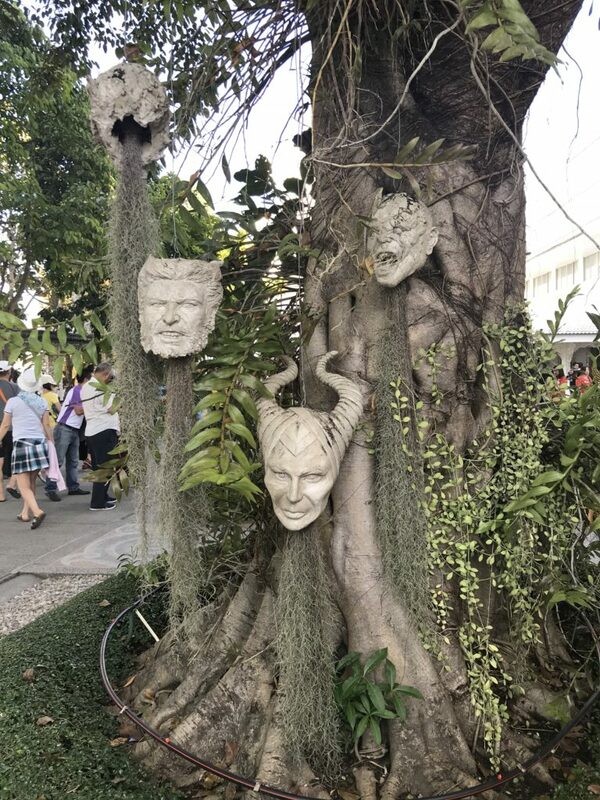 We did a double take when we noticed that all the trees had superhero heads hung from them. Poor Wolverine! 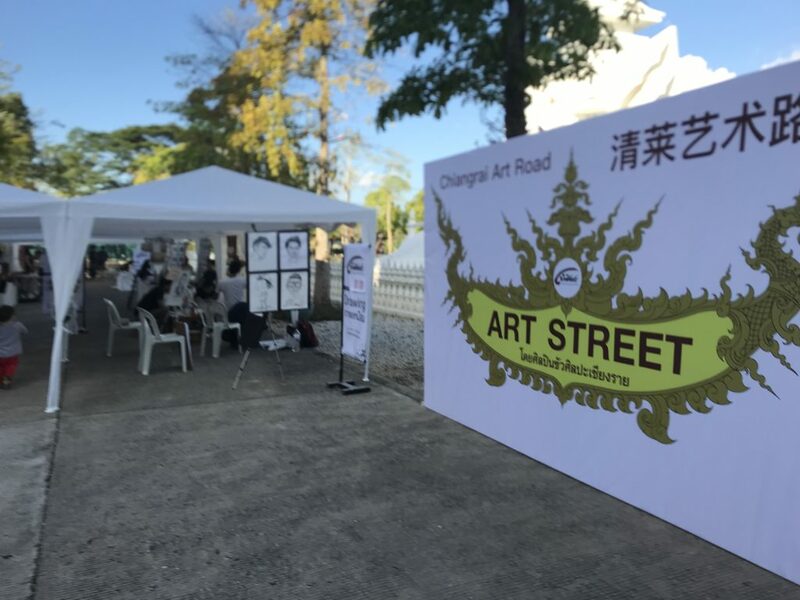 Towards the back of the complex you’ll find a small arts and crafts market called ‘Art Street’. I really enjoyed this – it was a much better market than some of the more touristy ones. There were wood sculptures, clay work, ink drawings, paintings. Most of the stalls had the artist working there, so you could see them in action and know who’s actually created the piece of art you’re buying. The White Temple certainly does have toilet facilities. I don’t usually take photos of public loos, but I just had to here. They were a work of art! There’s a free water fountain just past the gates, opposite the ticket booth for the temple. There’s also a small crafts market and lots of food and drink outlets in the area surrounding the temple. It’s worth making time to go into the market, if only for a bit of shade. There are some nice carved wooden chairs in there and a couple of very picturesque Koi ponds with fountains. You’ll sometimes see a ‘black and white tour Chiang Mai’ advertised. 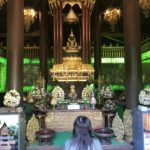 These tours take you to the White Temple and the Black House (Baan Dam). 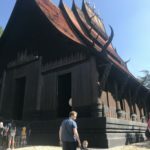 The black house (or Black Temple) is the house of the Thai artist Thawan Duchanee. You can read about our trip to the Black House here. 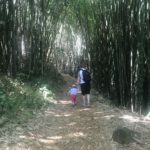 We loved our hike up to the Khun Korn waterfall. It was a great way to spend an afternoon with a 11mo and a nearly-3 year old. This is a nice, quick temple to visit. The statues and decoration are fantastic. Very detailed and decorated with shimmering metallic paint. The house of Thai artist Thawan Duchanee, and his collection of animal skins and parts. We were 50/50 on this one. It’s definitely interesting, but also upsetting and downright horrific in places. The original temple of the Emerald Buddha, that is now housed in Bangkok. 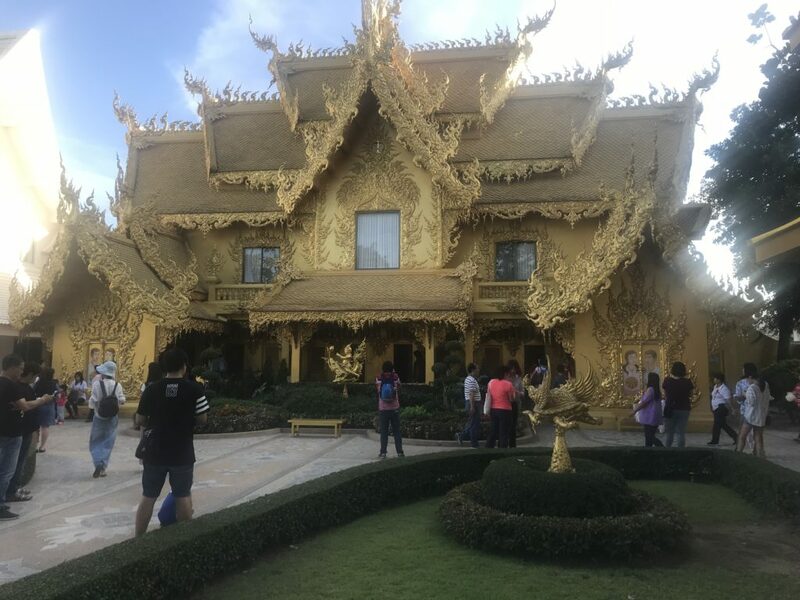 There’s a replica in this temple. The temple itself is small, but there’s some very beautiful paintings inside the temple and the Buddha itself is worth seeing if you haven’t seen the one in Bangkok.